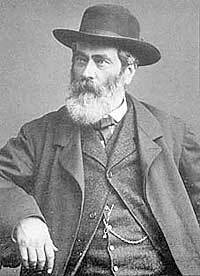 Richard Keene, Derbyshire photographer, was born in London on May 15th 1825, son of Richard Keene and Priscilla Kimpton. The family moved to Derby in 1828 where the father look up work as manager of Frost's Silk Mill. Following his education at Thomas Swanwick's academy in Derby, Richard Keene was apprenticed to Thomas Richardson & sons, printers of Ashbourne, moving to their London offices. He then worked for Simpkin Marshall & co where he learnt about publishing and bookselling. Keene returned to Derby, setting up as a printer, publisher and bookseller at 24 Irongate in 1851. He developed an interest in photography and with friends travelled, taking photographs of Derby and Derbyshire which he began to sell as prints. In time photography dominated his business and Richard Keene & Co became known for high quality topographical views. He produced private commissions for firms, estates and families as well as running a portrait studio. Over time he also took photos in many other counties. He was a founder member of the Derby Photographic Society, formed in 1884 and a member of he Photographic Convention of the UK. Keene had married Mary Barrow in 1851 and lived in Radbourne Street, Derby where he died in 1894, leaving 5 sons and 3 daughters.